Our research programs have been generating effective transfection reagents in order to undertake delivery of a variety of nucleic acids (plasmid DNA, siRNA, mRNA and others) to mammalian cells. For access to such reagents, please visit RJH Biosciences, a new company established to distribute effective transfection reagents to biomedical researchers. We have been conducting advanced research into nucleic acid delivery agents, commonly called transfection reagents, since 2004. 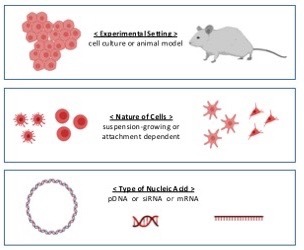 We commonly refer to the agents used for in vitro (ex vivo) modification of cells as transfection reagents, while usually reserve the phrase delivery agents for in vivo delivery of nucleic acids. We have been preparing the transfection reagents and delivery agents by in-house organic synthesis and testing their utility in specific applications. The nucleic acids we deliver were initially plasmid DNA (pDNA) to express desired genes in cells, and short interfering RNA (siRNA) to silence specific genes, but our recent work has employed messenger RNA (mRNA) as well for gene expression. We extensively published our work with detailed structure-function studies, and identified specific reagents that could be effective in modifying certain cell types and with select nucleic acids. We are happy to share the lead reagents with research community through a biotech company, RJH Biosciences Inc. You are welcome to visit the company website and request specific products for use. For the University of Alberta community, our products can be conveniently obtained from the Biochemistry Stores.